The silvery, skittering, and toxic liquid can be found in some antiques. Mirrors can be backed with mercury and tin; Clock pendulums might be weighted with embedded vials of mercury; and barometers, thermometers and lamps may have mercury in their bases for ballast. The problem is that mercury in old items can leak, particularly as seals age or when the items are moved, according to a study by the Centers for Disease Control and Prevention. Ask Ann Smith, whose heirloom clock's pendulum leaked mercury onto the carpet of her gift store in rural Delhi, New York, as a cleaner moved it. An attempt to vacuum the tiny silver balls off the carpet only made things worse, requiring a hazardous materials team to be dispatched to Parker House Gifts and Accessories last summer. "I didn't really think it was the hazard that it became," Smith said. "I grew up in the days when you played with the mercury that spilled out of a thermometer and nobody knew it was a problem." Exposure to high levels of mercury can cause damage to the brain, heart, kidneys, lungs and immune system. Even the few ounces found in some antiques can be dangerous. Aptly nicknamed quicksilver, it's hard to clean up, and can become an inhalation hazard if it vaporizes. Dr. Wanda Lizak Wells of the New York state Department of Health, co-author of the study, suggests getting professional help if even a few ounces spill from an old barometer. And never use a vacuum. "That is one of the worst things that people can do," she said. The mercury can be heated up by the vacuum motor and vaporize. That was the mistake Smith's clock cleaner made at her shop near the Catskill Mountains. The vacuum was discarded as hazardous waste. The amount of mercury in a fever thermometer, however, can be safely cleaned without expert assistance as long as proper steps are taken, like wearing old clothes and rubber gloves, according to Wells. The study highlighted five other cases from 2000 through 2006 in New York state, which collects hazardous response data in a way that allowed researchers to identify cases involving antiques. Among other examples in the report: A house in Long Island was cleared after two cups of mercury spilled onto a carpet from an antique clock that tipped over. Four workers at a New York City antique store were sent to the hospital for evaluation when mercury spilled from an antique clock column. A hazardous materials team was called to clean up more than an ounce of mercury from a Syracuse road after a spill involving an antique lamp. Researchers said none of the incidents caused acute health problems. The CDC report noted that about a dozen states restrict the sale of products with mercury. Antiques experts say there are relatively few items that still contain it. 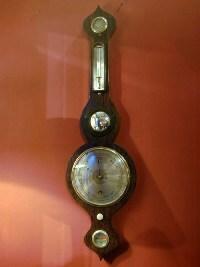 Among those that do are old barometers and thermometers, which account for only a small slice of the market. Donald R. McLaughlin, a veteran antiques dealer in Ohio and president of the World Antique Dealers Association, said many such pendulum vials broke decades ago. "There aren't many left," he said. "I rarely see them anymore, and I'm out every day." Still, researchers urge people to inspect old items containing mercury to make sure the seals are tight. They recommend removing or replacing mercury components when possible, though they warn never to drain the mercury. When moving a piece containing mercury, researchers suggest placing it in a leak-proof container.